« New Gift Shop opens at the McCloud Hotel! Mt. 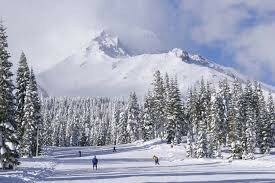 Shasta Ski Park is preparing for the upcoming winter season and expects to be open by mid-December. The Ski Park in preparation for the winter made several changes and improvements during the summer. This includes removing the Rope Tow and installing a new 300 foot Sun Kids moving carpet in the Panther Creek base area which will provide service to tubing and ski/snowboard learning guests. Another major improvement includes the remodeling of the deck on the Panther Creek side of the upper lodge. This improvement provides more seating, event space and a fire pit. As mentioned above the Tubing center will be moved up to the Panther Creek area and will now have expanded hours. The Tubing hill will operate seven days a week. Hours will be 9 am to 4 pm Sunday through Wednesday and 9 am to 8 pm Thursday through Saturday. Prices will be $20 for adults and $15 for children. This season we will be having a huge new year’s eve party on December 31st. Skiing and Boarding from 3pm to 10 pm for just $20, Torch light Parade, Glow Items and Party favors, Dj in the main lodge and a huge fireworks show at 9pm. Our annual Big Air Contest will be on Feb 22nd, Rail Jam on March 22nd and our annual Pond Skim on April 12th. Friday, Saturday, Sunday and holiday periods $44 Night Skiing from 3pm until 8pm Thurs, Fri, Sat $20 *Night skiing extended to 9pm during holiday periods with additional nights During the Christmas holiday period.